The Baltimore Orioles are 1-1 in their first two games of the season against the defending World Champion Boston Red Sox. The Orioles defeated the Red Sox on Opening Day Monday 2-1, then Baltimore lost to Boston Wednesday 6-2. Outfielder Nelson Cruz scored all four of the Orioles’ runs. In February, the Orioles signed Nelson Cruz to a one-year deal. Cruz played with the Texas Rangers for the past eight seasons, including a 50-game suspension last year due to a steroid scandal. 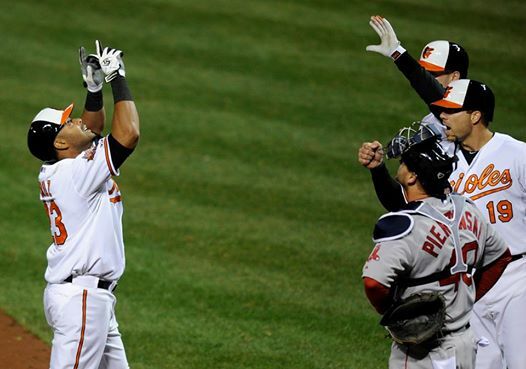 Nelson Cruz was the Opening Day hero Monday in his first game as an Oriole. Cruz scored Baltimore’s first run then homered in the seventh inning, breaking a 1-1 tie giving the Birds a 2-1 win over the Sox. Cruz is the 25th Oriole in club history to homer in his first game. On Wednesday’s 6-2 loss, Cruz tied the game in the fourth inning with a two-run blast. Word on the street is Nelson Cruz still hasn’t found a place to live in Baltimore. I hope he finds a place soon because Cruz is responsible for all of the Orioles’ 2014 offense.